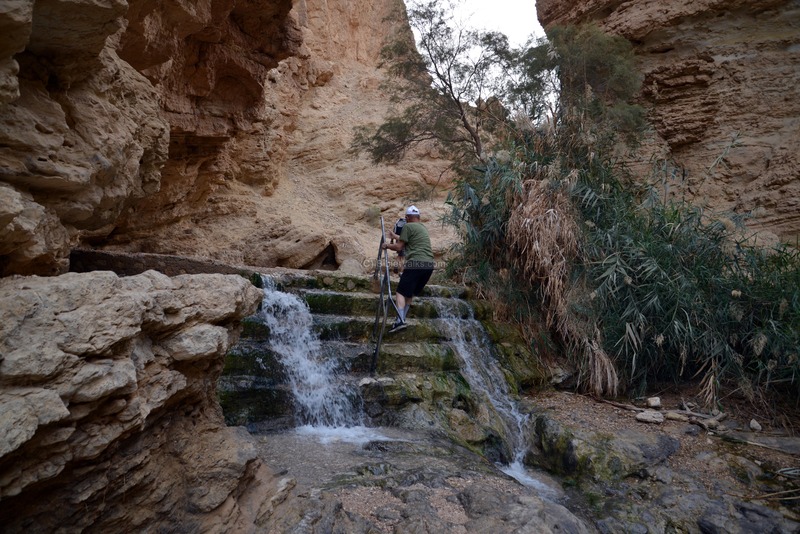 Nahal Bokek is a brook which flows into the south-western side of the Dead Sea. 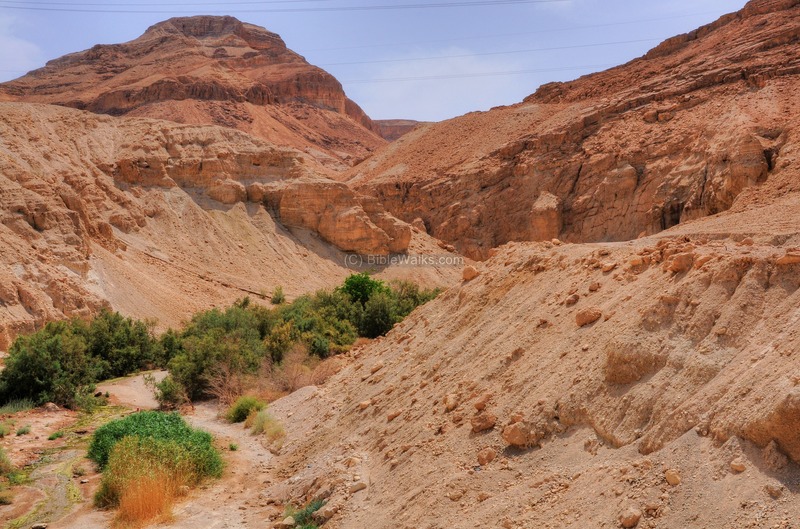 On its delta is the oasis of Ein Bokek, where ancient farmers once grew dates, spices and produced the precious balsam perfume. 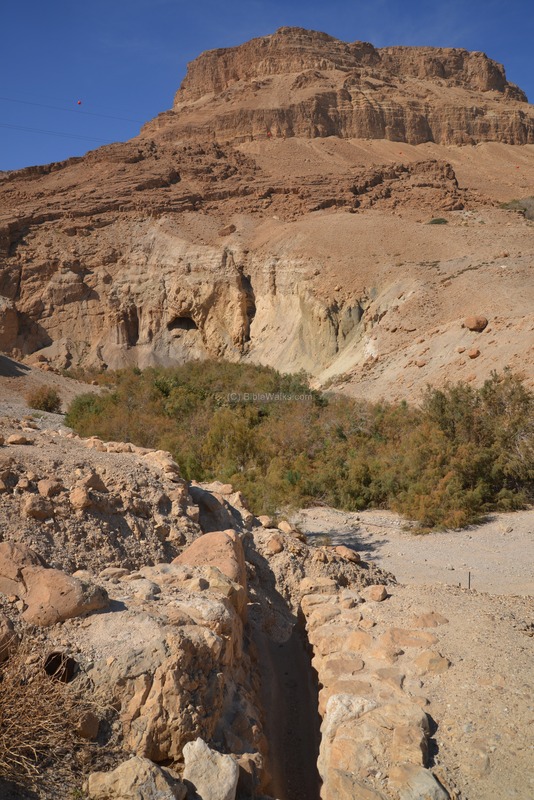 Ruins of a Roman/Byzantine fortress are located on its outlet, and a system of aqueducts and pools conveyed water from the Ein Bokek spring. 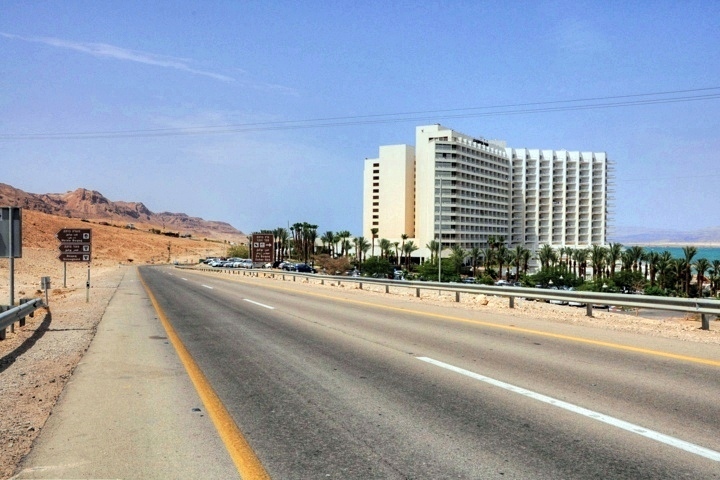 In modern times the delta of Ein Bokek is also the location of the modern Dead Sea resort, with a number of hotels and beaches. 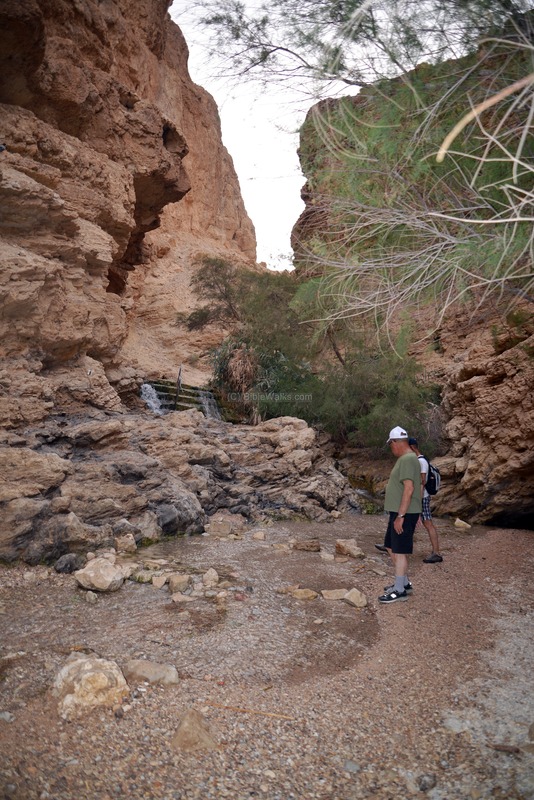 Nahal (brook) starts from Rosh Zohar, drops 800m in altitude to the Dead Sea. The Bokek spring - the main source of water in this area - is located 1.1km to the west of the Dead sea. The fortress is located on the eastern foothills. The area of the Nahal Bokek and nearby ancient town of Ein Gedi were prosperous in the Hellenistic and Roman period. Their wealth was based on dates, vegetation, and the precious balsam (persimmon, Hebrew: "afarsemmon") which was used to manufacture perfume (Hebrew: bosem). The Balsam was cultivated and processed in the delta of the Bokek brook. 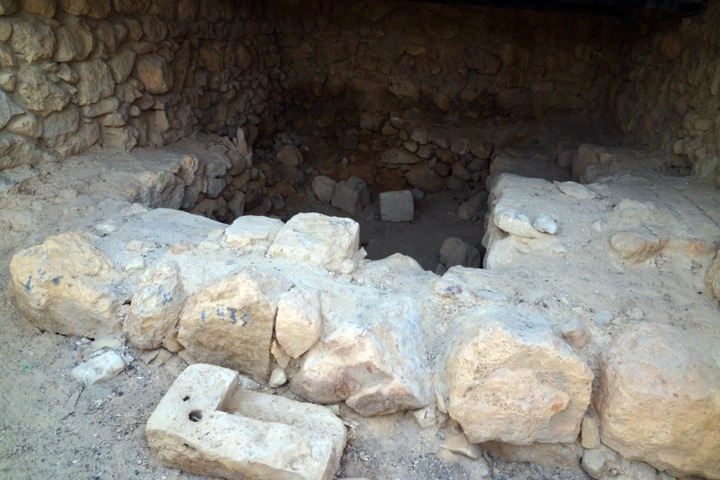 A farm house, dated to the Hasmonean period, was excavated in the center of the park area of the Hotel district. 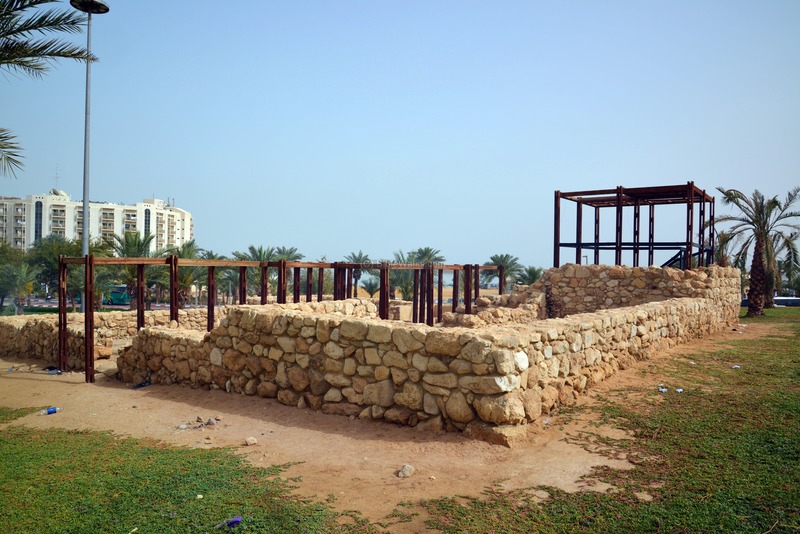 The structure, 23m x 23m, was reconstructed and open to the public. A unique industrial complex (officina = factory complex) which manufactured the balsam perfume, was discovered in Bokek . 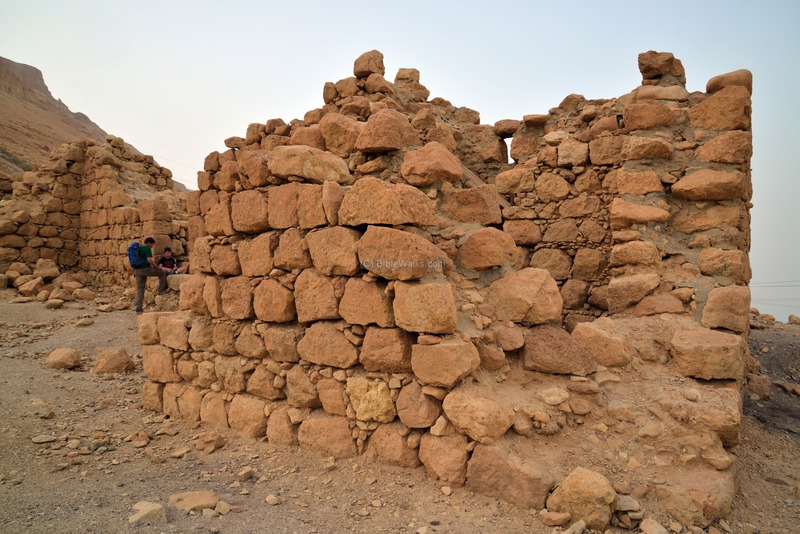 It dated from Herod's reign (early Roman period), destroyed during the Great Revolt (perhaps by the Jewish zealots), was then reconstructed and continued until the Bar Kochba mutiny (2nd C AD). 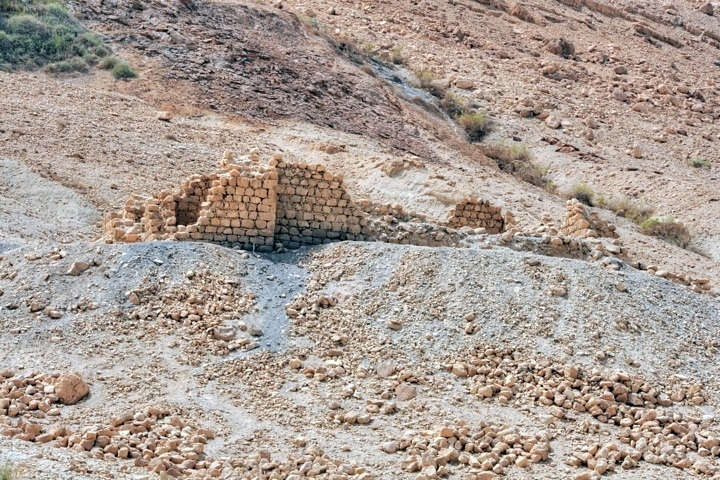 The Fortress above the north bank of the Bokek brook is a Roman/Byzantine military fortress. 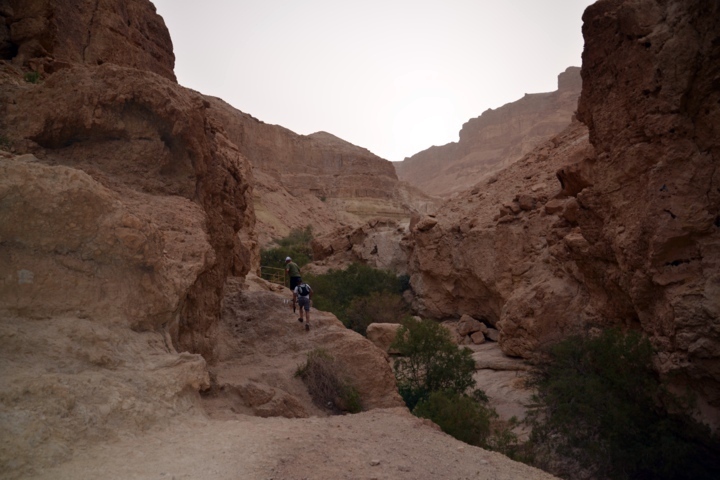 It protected the frontier of the empire, the Dead Sea coastal road, and the ascent route through the Judean desert. It also guarded the farming area of the Bokek delta where the balsam plants were cultivated and manufactured into the precious oil. The fortress in Bokek was built during the reign of emperor Constantine the great (324-337 AD) or his son, Constantine II (337-361). 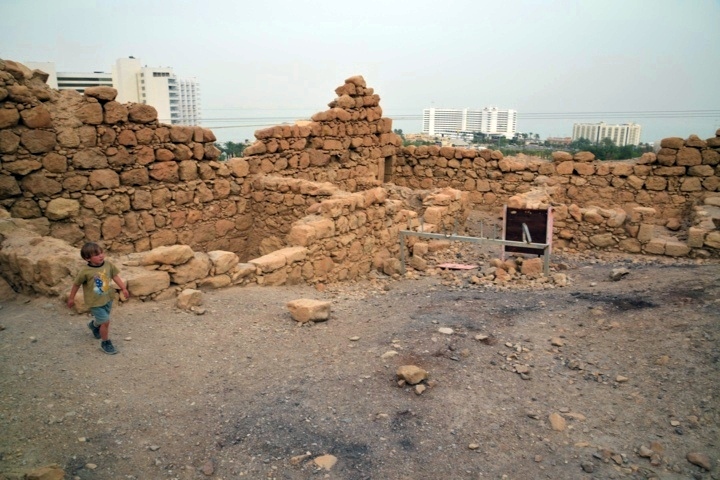 There were 4 phases of destruction and reconstruction, until it was finally demolished during the Arab conquest (634-635). 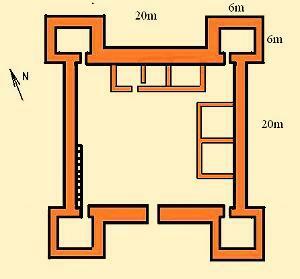 The plan of the fortress is square, 20m long, with four towers (6x6m) on each corner. 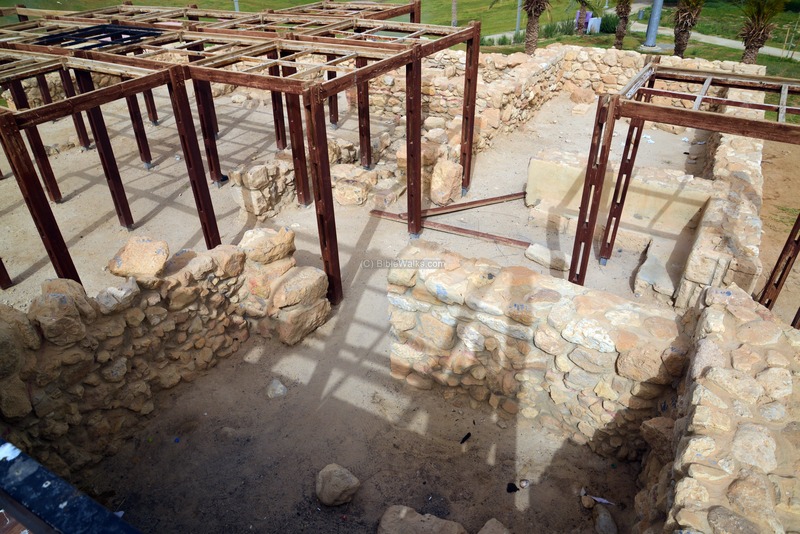 Two double-story structures were built inside the fortress, used for the soldiers' barracks. The cities and roads during the early periods are indicated on the Biblical Map below. 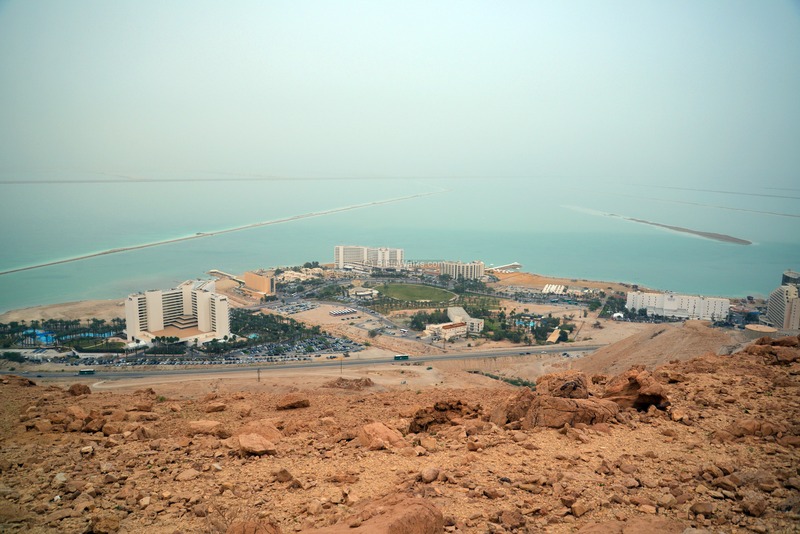 Bokek is indicated as a red square, and is positioned on the crossroad of the coastal road and the ascent road to Arad and Malatha and Hebron. It was located on the most eastern position along the the ascent road. Malatha is where the regional Roman military cavalry headquarters - the Cohors I Flavia Equitata - were located during the Byzantine period. Their soldiers were stationed in Bokek, and guarded the road. 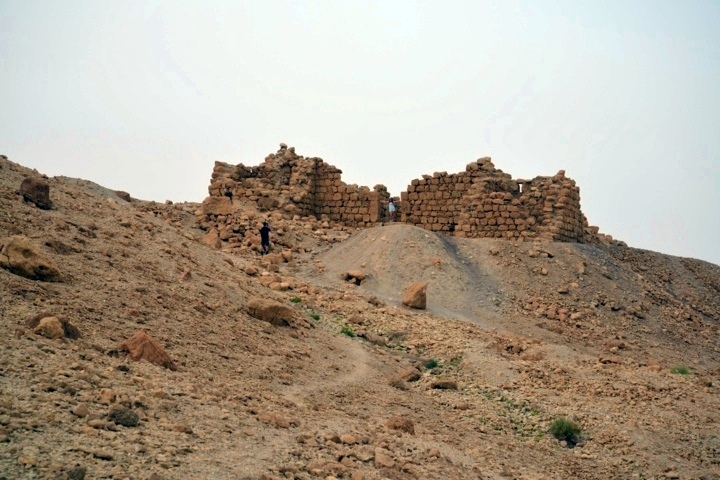 The Bokek fortress was positioned on the eastern frontier of the Roman empire - the Limes Arabicus. 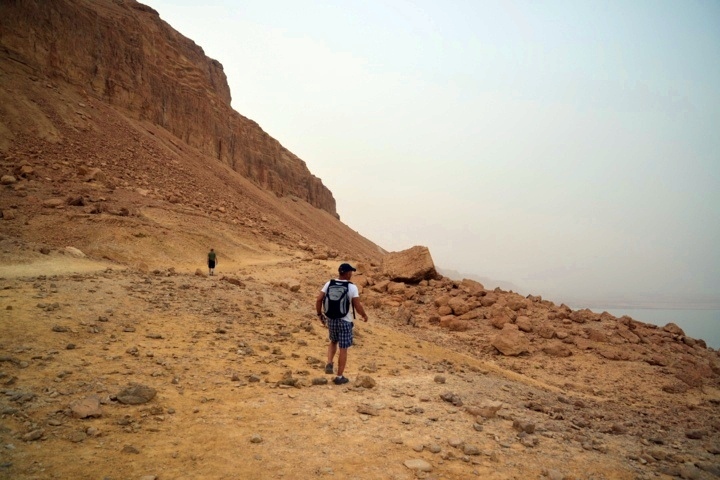 This border line extended 1,500km from Northern Syria to the Red Sea, and its defense was based on forts, watchtowers and connecting roads. 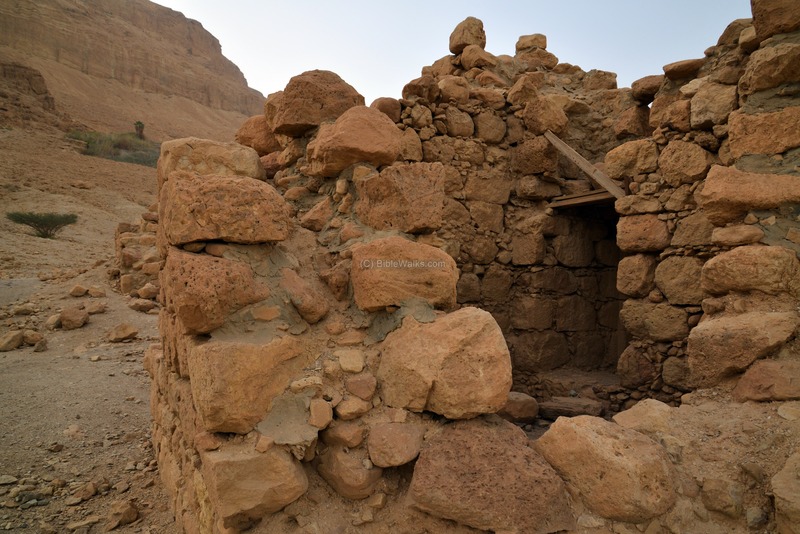 These protected the empire from attacks of the barbarian tribes of the Arabian desert. At the end of the 3rd C the Limes was restructured by Diocletian, renamed to Limes Palaestinae. The fort was constructed several years later in order to enforce the border line. The fortress, as well as other structures, were excavated by a team headed by Mordechai Gichon (Tel Aviv University) during the years 1968-1970, followed by three more minor excavation seasons (until 1976). 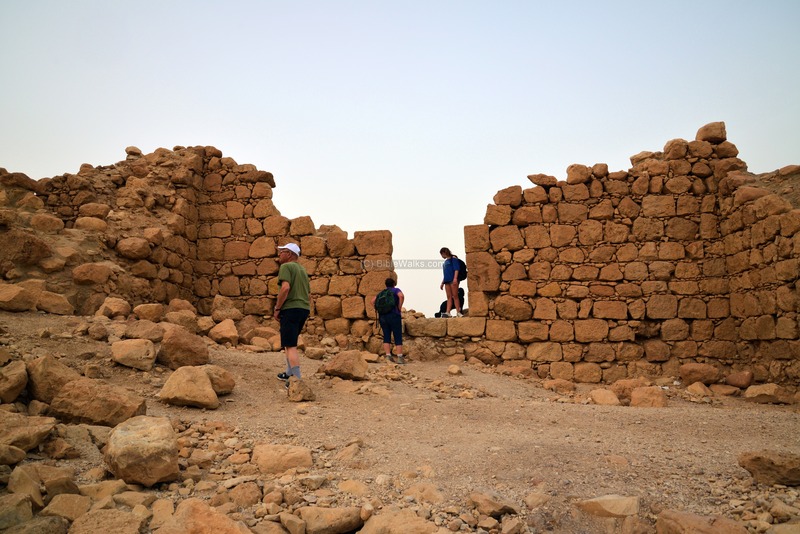 The ruins are accessible from a path originating from the northern hotels in Ein Bokek. 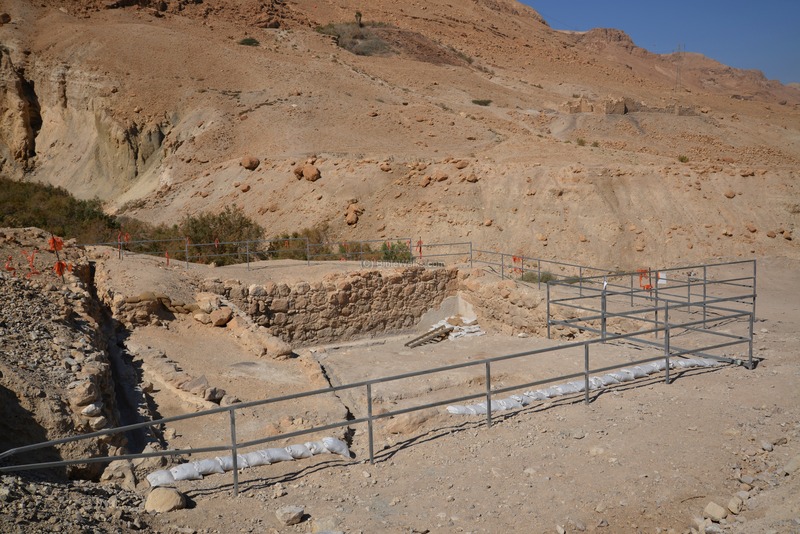 A conservation project of the Bokek stream is in progress, including new excavations and restorations of sections of the aqueduct. A drone captured these aerial views over the east side of the Ein Bokek valley, close to road #90. A section of the south aqueduct, that conveyed waters from the spring to the fields and farmhouse, is seen on the lower left side, near the Byzantine period reservoir. Entrance to the Bokek brook is close to the northern section of the Ein Bokek Hotel area, a section of the beach along the Dead Sea. 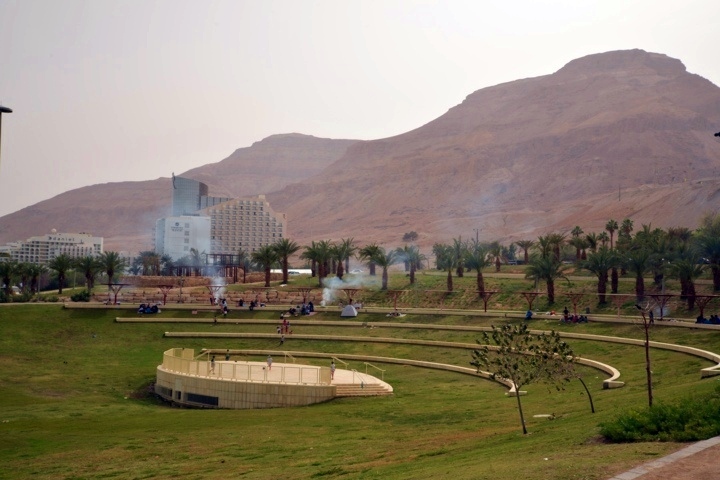 Water flows from the Ein Bokek spring, about 1.5km inside the valley, to the delta where the hotels are located. 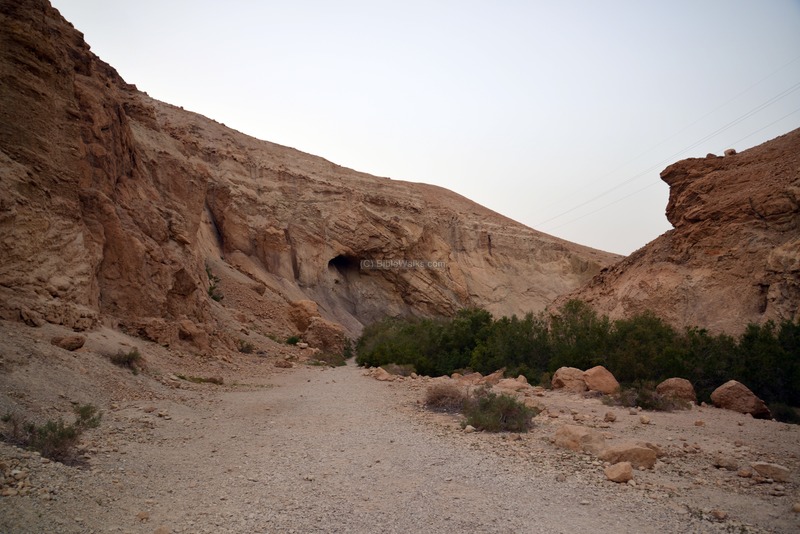 In ancient times the waters were channeled by an aqueduct to water the crops grown in the area. 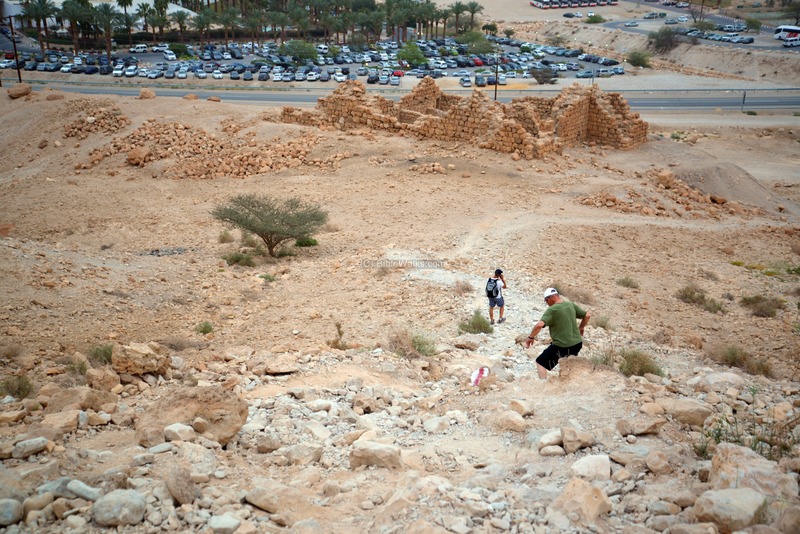 The ruins of the Roman fortress stands above the entrance to the brook, and overlooking the Dead Sea route. 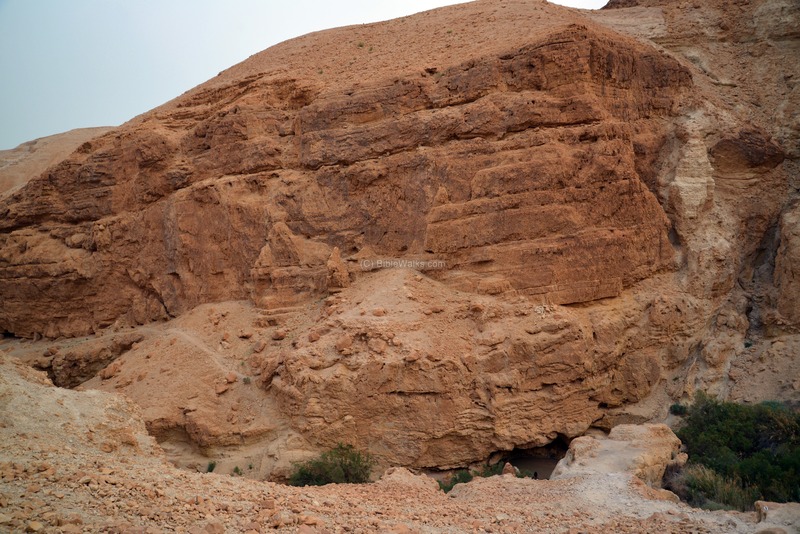 The mountain above the fortress is at 41m above sea level, while the fortress is at -336m (below sea level) and the brook (which is hidden below the bottom of the next photo) is at -360M. 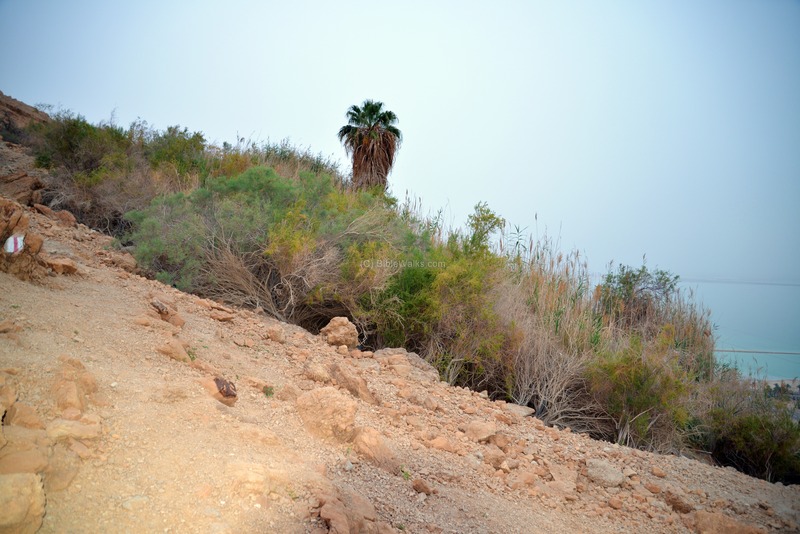 A patch of green and a lone palm tree, seen above the fortress, which is an unusual color in contrast to to the brown color of this dry desert, is a spring which was the source of water for the fortress. Access to the fortress is available by a path from the brook. Below - the southern side of the fortress. The entrance to the Roman fortress is from the south side. The remains of the two south towers can be seen on both sides of the photo. The walls are 2m wide, and were preserved up to 6m high. On each corner of the fortress is a 6m x 6m tower. 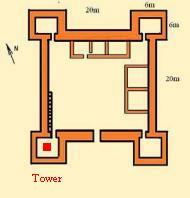 The towers had three levels, raising above the walls of the fortress. This design was a common Roman design, called "Quadriburgium" - square with large corner towers. The towers were used as watch towers, and also as a "keep" - an inner fortress used in case the main structure was breached. The tower seen in the photo is located on the southwest side. Access to the tower was through a narrow door, seen below. The tower had a second and third floor, which was accessed via a flight of stairs, seen on the right side of the door. 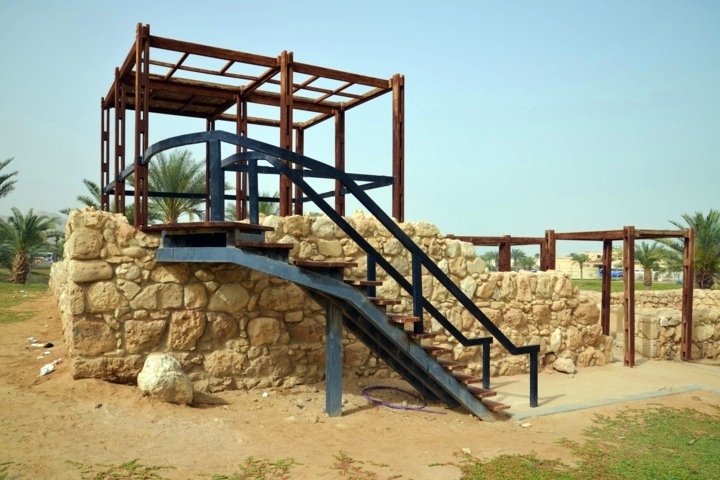 These stairs were added to the fortress during the last phase of Byzantine occupation, following the Persian conquest. This is the only tower with steps, while the other towers required the use of several wooden ladders in order to climb up to their upper floors. The lower ladders were retracted into the towers during an assault. 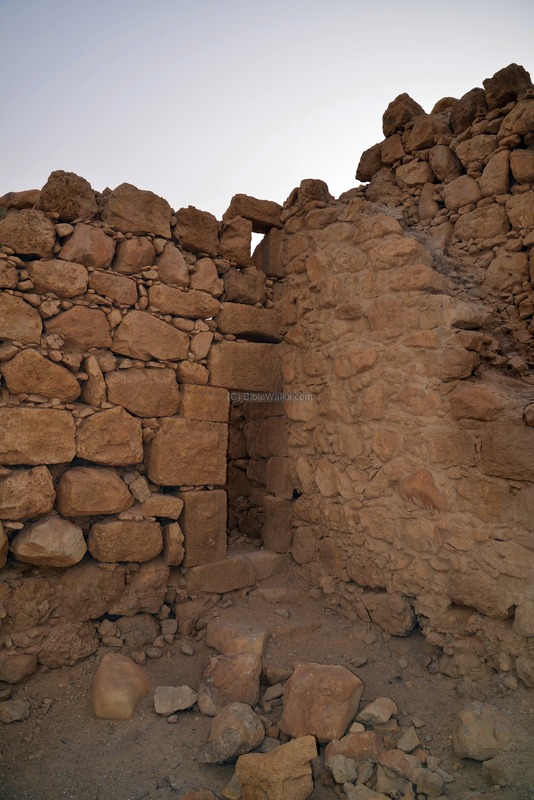 Above the lintel of the door to each of the towers is a relieving (discharging) arch. 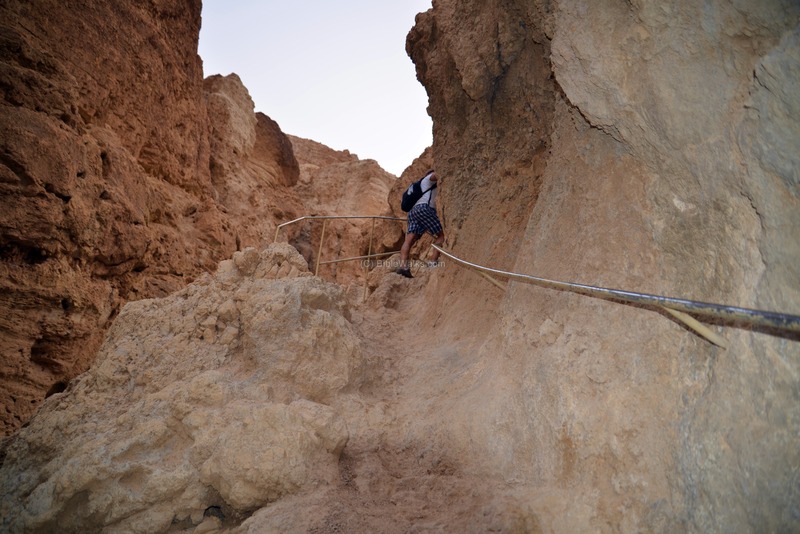 Its purpose is to take off the incumbent (leaning on) weight, thus adding stability to the wall. 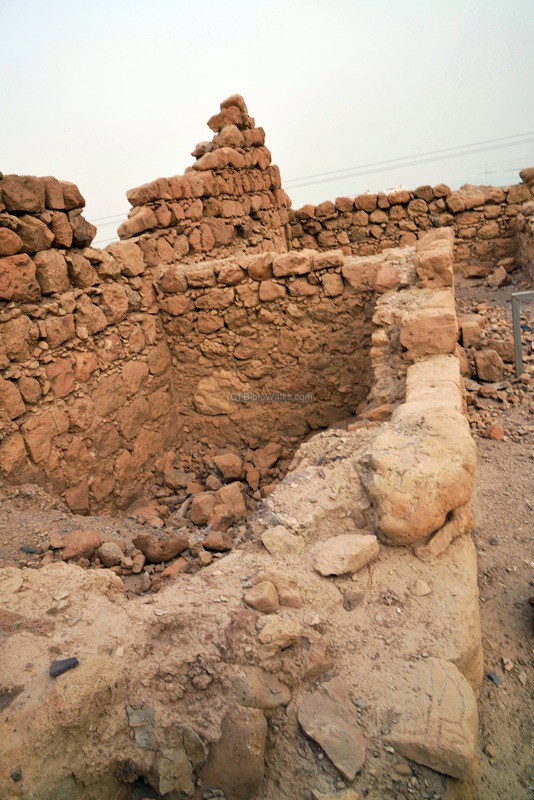 This architectural element was a new engineering technique at that times, and was very common during the Roman period. The south-east corner tower is seen in the following picture. Notice the corridor to the door's entrance from the inner side of the fortress. The corridor was planned to narrow down to a small entrance, so in case the fortress was breached its defenders could shut the door to the tower and continue to protect themselves and wait for reinforcements. (c) Byzantine period - mid 5th C until the Persian conquest (614-618 AD), which caused a severe destruction to the fortress. (d) Heraclius - a hasty repair following the Byzantine emperor's victory over the Persians (624), a phase which lasted for only 10 years until the Arab conquest. Following the Arab conquest the fortress was abandoned by the soldiers, and was partially in use for several more years. 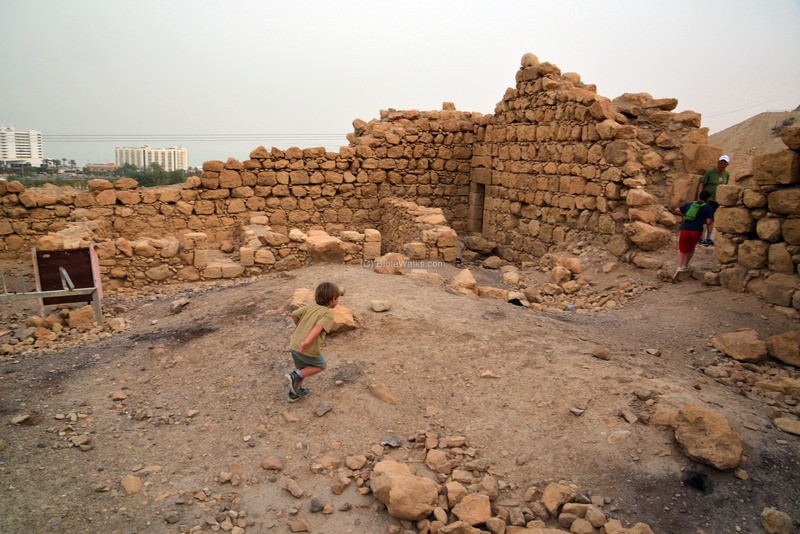 On the north side of the inner courtyard was a 2-level structure, seen here behind the boy. 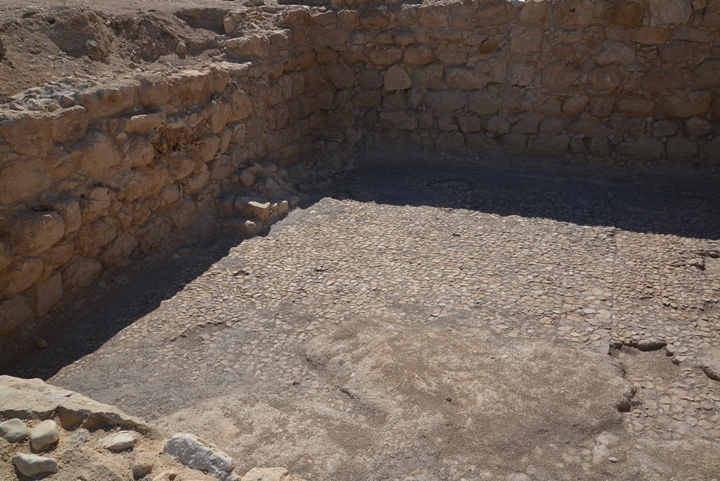 Another structure stood on the east side of the courtyard. Its base are seen here behind the running boy. 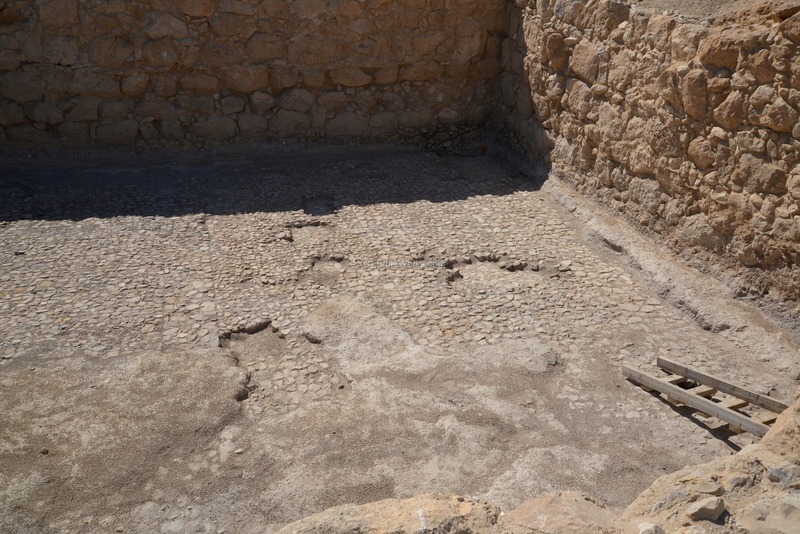 The archaeologist suggested that these two double-story structures, including the four corner towers, provided residence for 48 Roman soldiers who were stationed here. 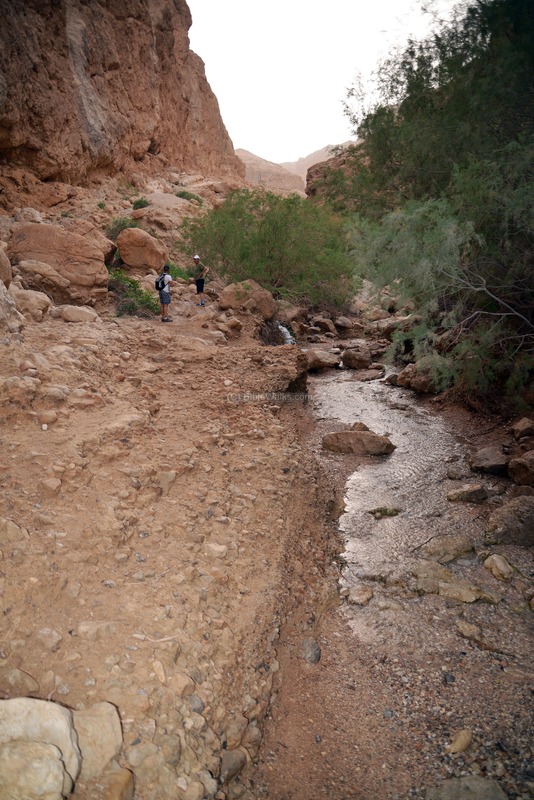 Walking along the course of the brook is a favorite among the visitors to the hotels of Ein Bokek. The entrance to the valley is just several hundred meters walk from the north hotels. 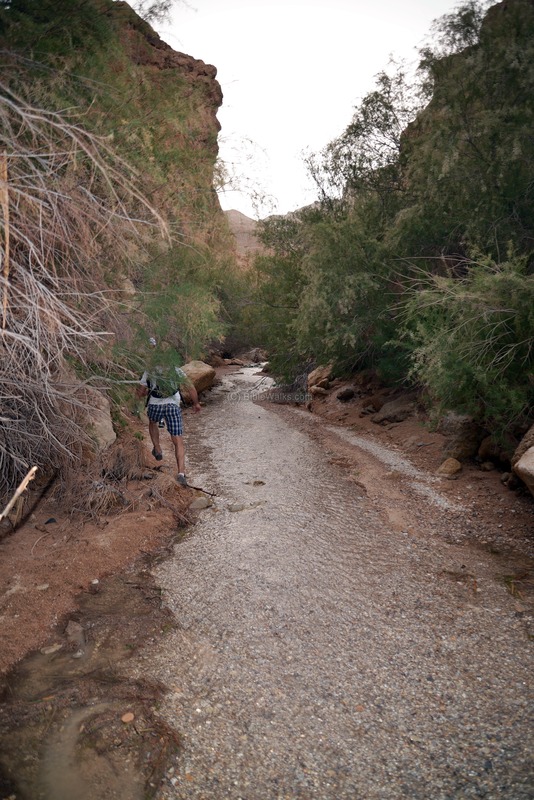 The eastern section of the brook is wide, with an easy path along the floor of the valley. 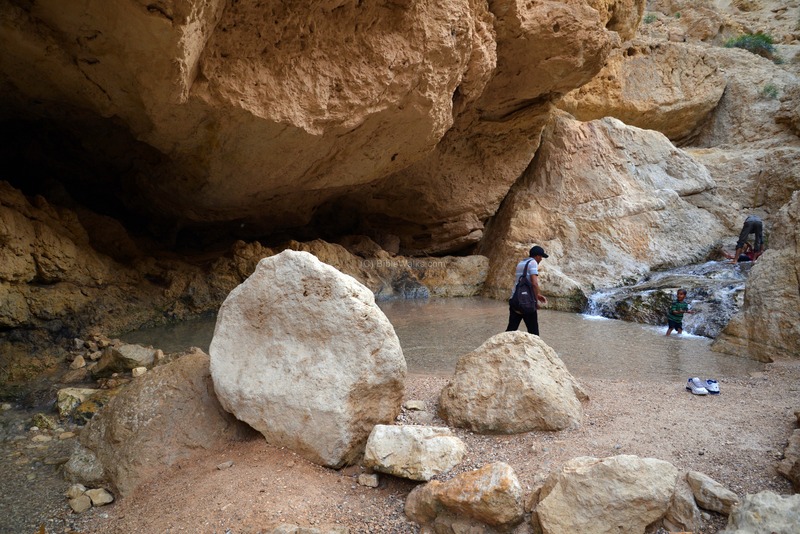 During the winter and spring there is water along the brook, and you need to cross the shallow waters at several points along the path. The path leads to the Bokek falls. 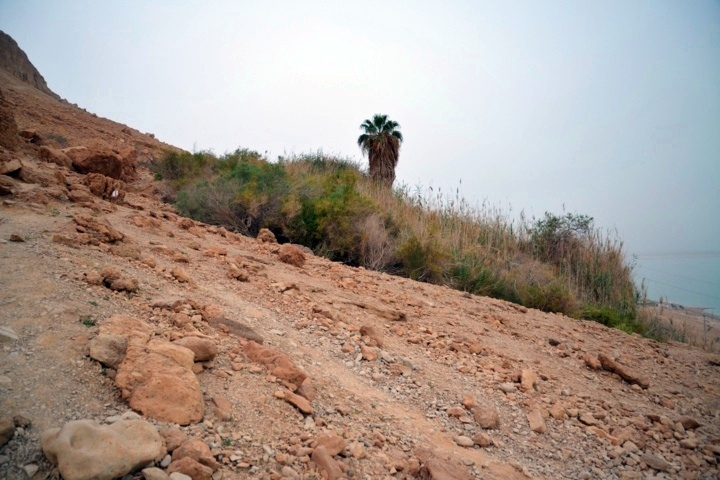 The path along the valley is either on the water level, or above the valley. Along the brook are a number of mini falls. 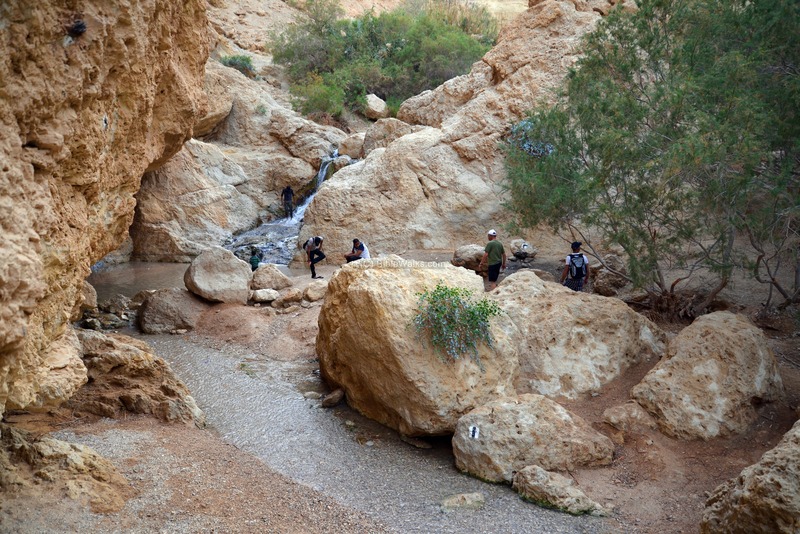 You can continue westwards along the valley towards the Bokek spring. Due to the late hour, we decided to take the ascent path up to the northern cliff above the falls. The climb to the trail along the Bokek lower cliffs was much more difficult, as we had to cover a height difference of 100m with a very steep climb. Looking back several times along the ascent provided remarkable views, and also offered a minute or two to catch my breath while taking the shots. We finally reached the flat trail, 100m above the brook. 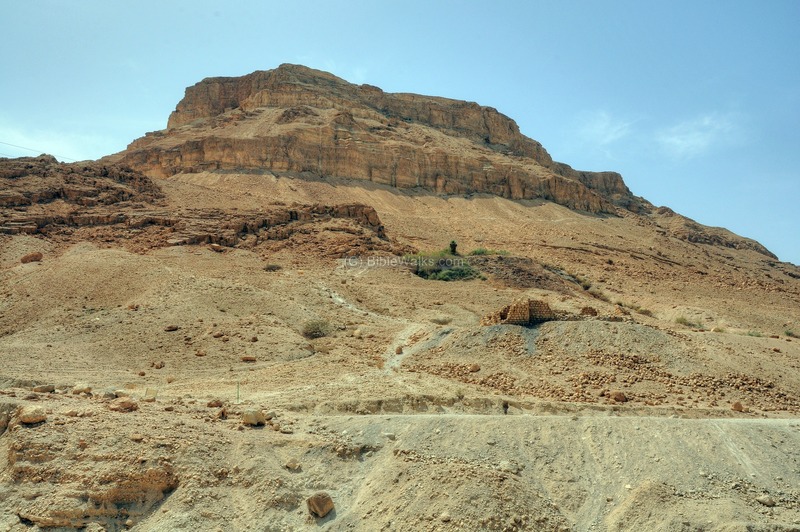 The mountain, along the left side, towers 250 meters above the trail. 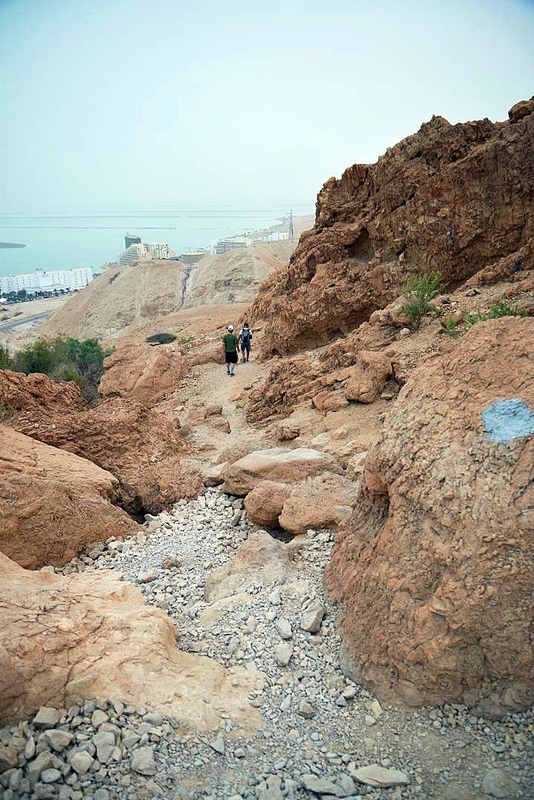 From the trail are great views of the Dead Sea. 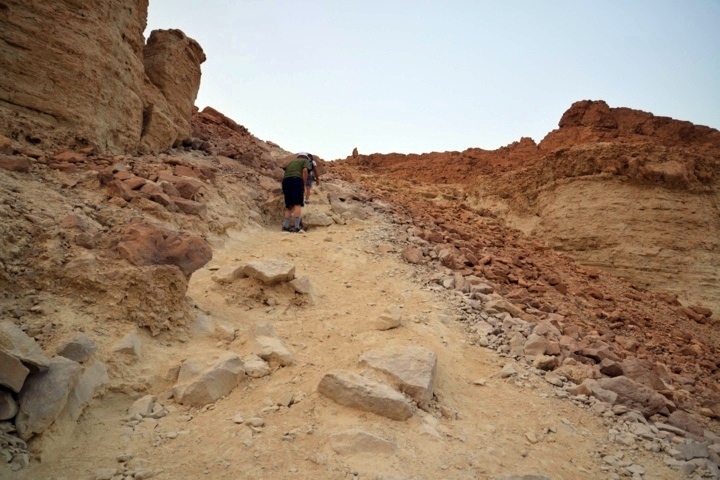 The trail continues for another 1200 meters towards the north, but due to the late hour we descended back to the hotels. Walking down to the fortress is by the path called Ma'ale Bokek (Ascent of Bokek). Along the path are nice views of rock formations. 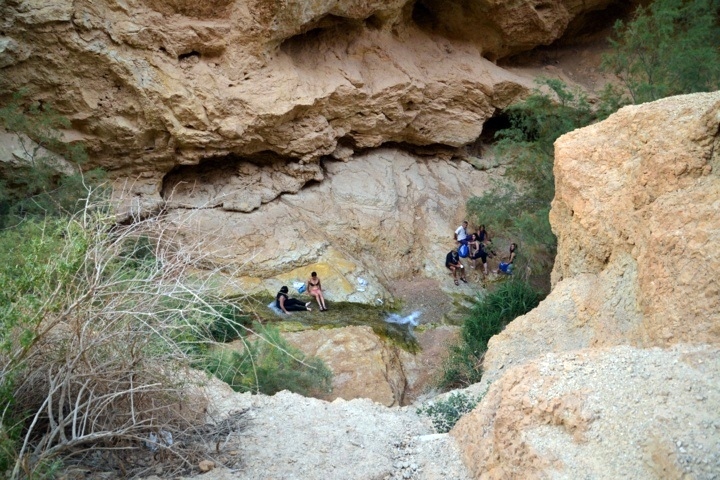 A spring is located 150m above the fortress. 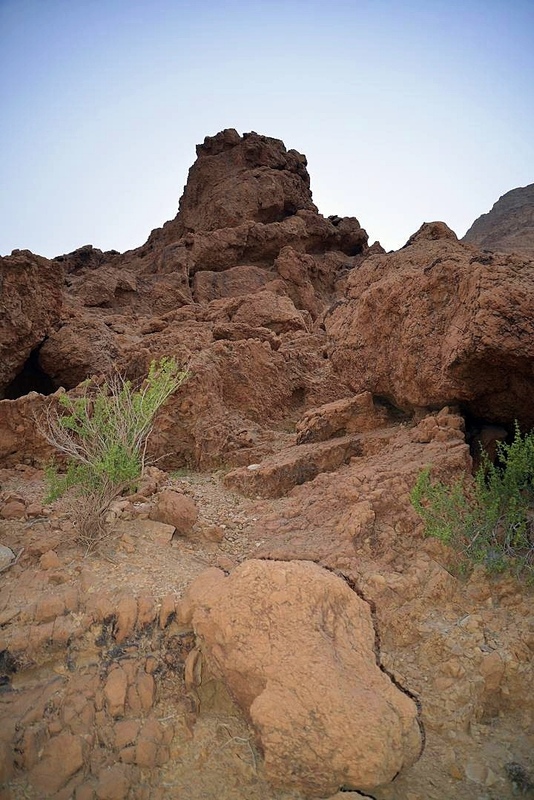 It was the source of water supply for the fortress. This is a warm spring, with a temperature of 39 degrees Celsius. 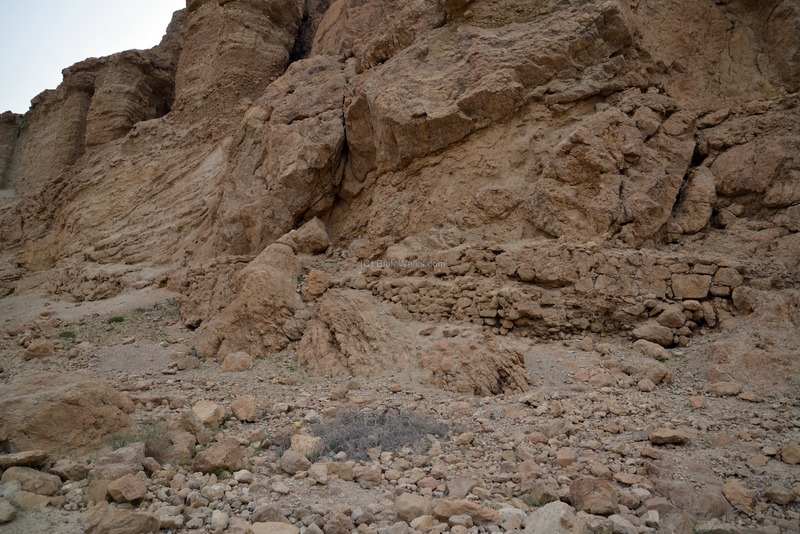 Remains of an aqueduct, conveying water from Ein No'it to the fortress, were found along the way down from the spring to the fortress. Traces of the aqueduct are seen on the way to the spring. In this section it is on the north bank of valley. The aqueduct conveyed water from the spring of Bokek to the delta of Bokek, where crops were grown. A set of pools stored the waters. 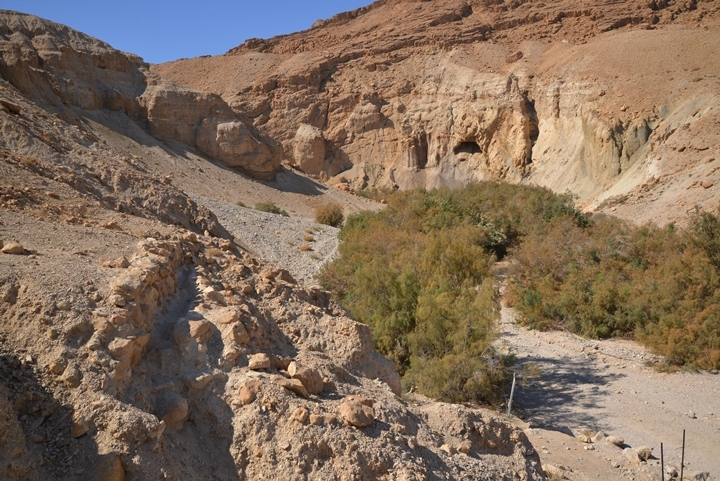 The aqueduct starts from the Ein Bokek spring, about 1.1kM inside the valley, and flows downwards along both banks of the valley, crossing the valley on bridges. 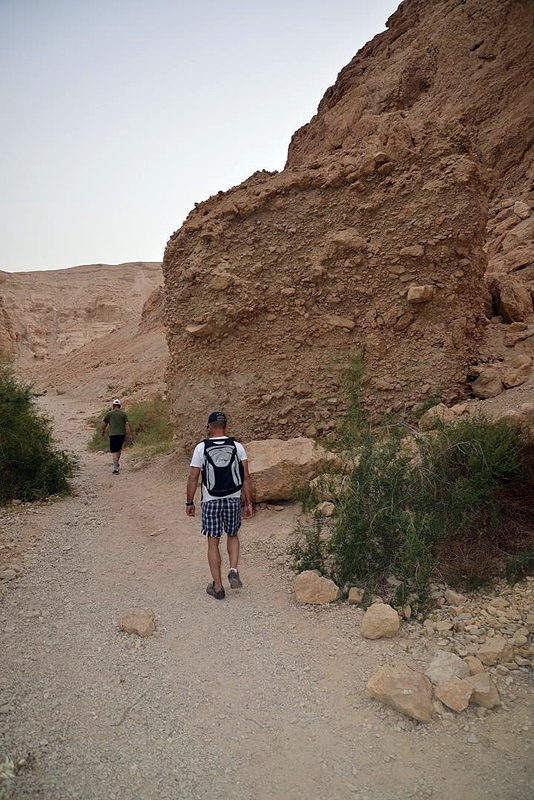 The height difference is 105m between the spring (-223m) and the Dead Sea (-380m). Its plan is described in the map of the survey. 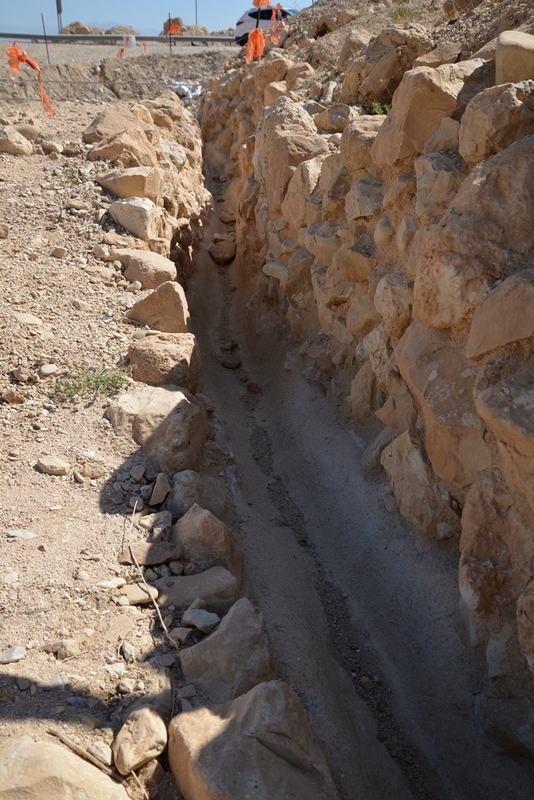 A section of the south aqueduct is also seen close to road #90. Only few sections of the aqueduct and water supply system survived, such as a recently excavated reservoir. The ancient aqueduct was first constructed in the Hasmonean period, maintained and upgraded during the Herodian, Roman/Byzantine and Early Arab periods. The Bokek spring has a strong flow of 40-50 cubic meters of water per hour. During the ancient times it had great water quality (500 milligram Chloride per liter), therefore it could support a large farming area in this dry desert region. In modern times, though, the water became polluted due to the Rotem plain industries, but there are plans to divert the pollution from the sources of the spring. 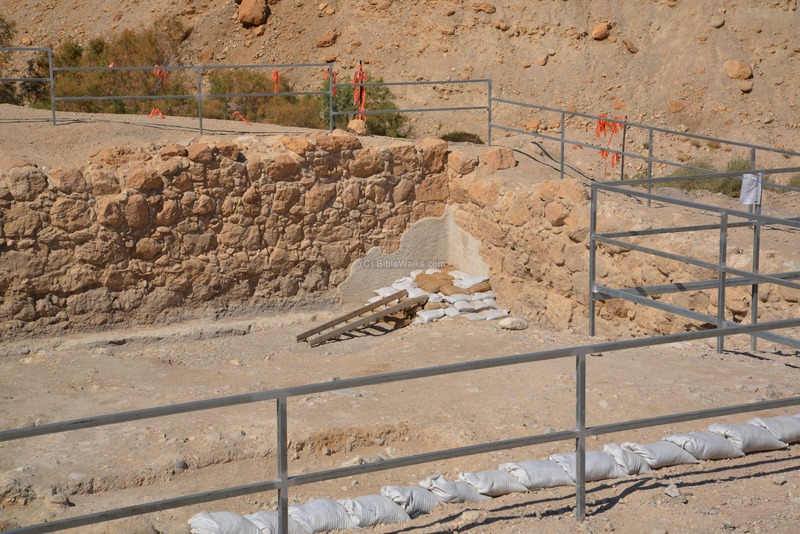 Near the road is a large reservoir, that was recently excavated and underwent conservation. 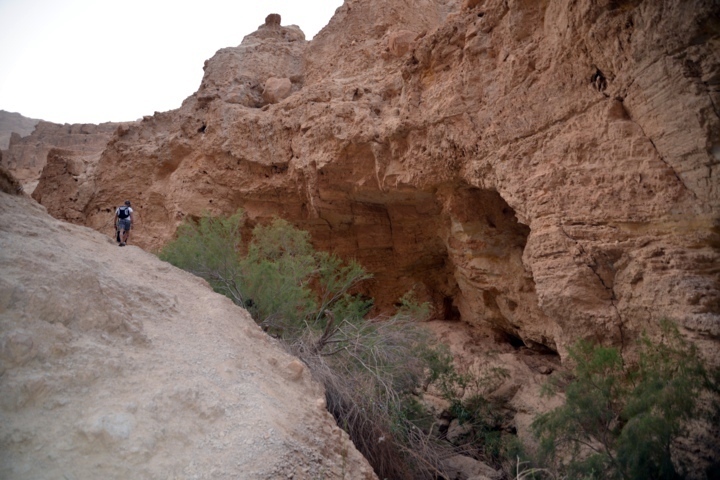 It tapped to the aqueduct, seen in the photo below on the left side, via a small channel. 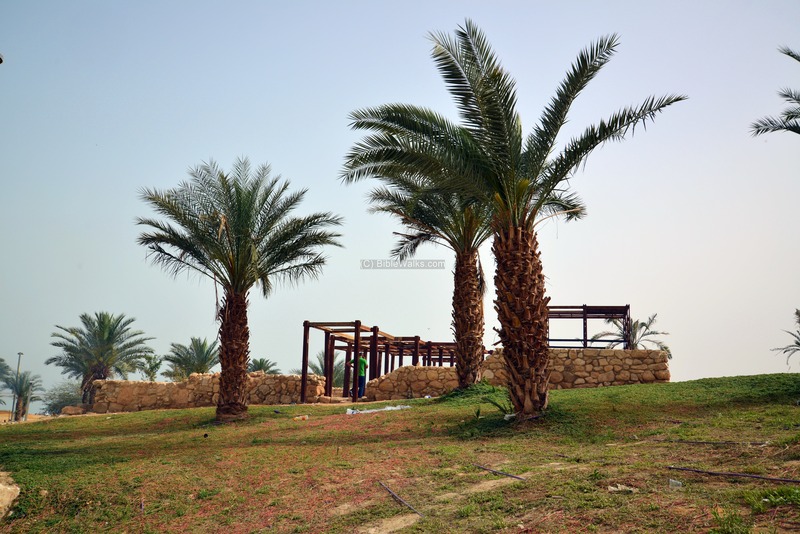 The reservoir was built during the Byzantine period and was also in use during the Early Arab period. The next photo is another view of the reservoir at the side of the pool. Notice it is close to the side of the road, just a few steps away. 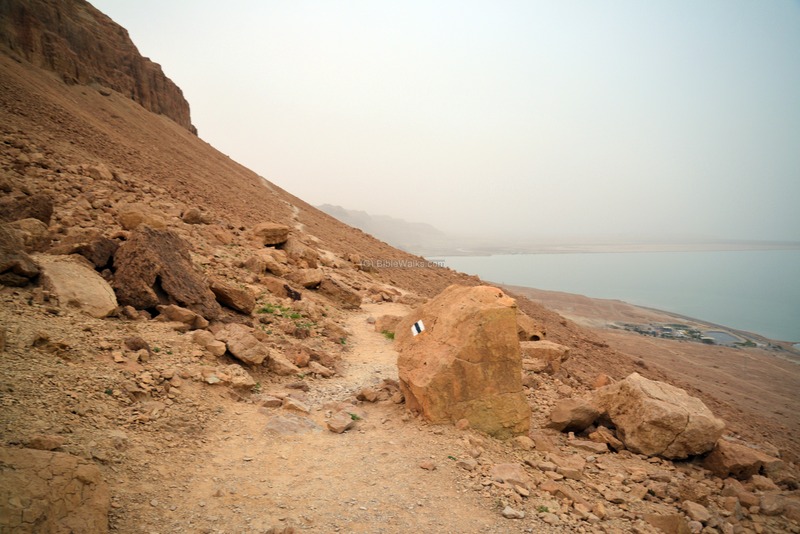 The area of the reservoir is 12m x 12m. The bottom of the reservoir is paved with small stones. 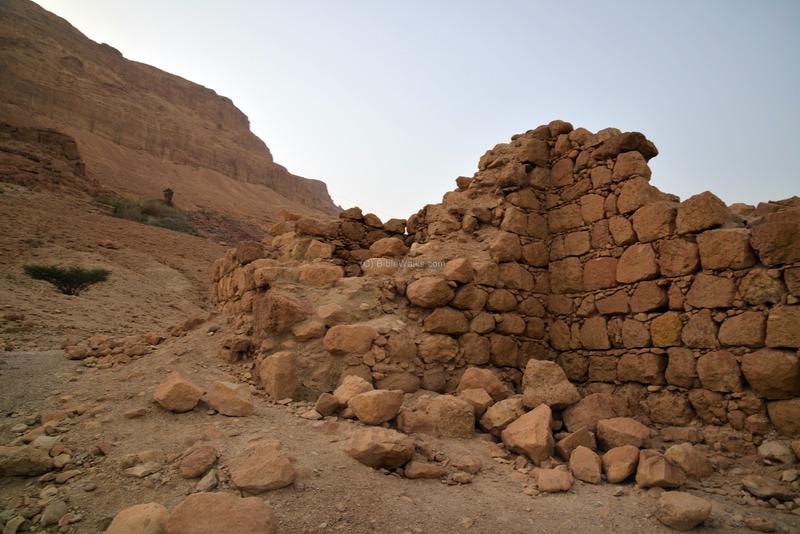 The 1.2m thick walls are built of two rows of fieldstones, filled between them with soil and gravel. Remains of plaster are seen on the corner. Ein (Spring) Bokek is also the name of the hotel district along the shores of the Dead Sea. 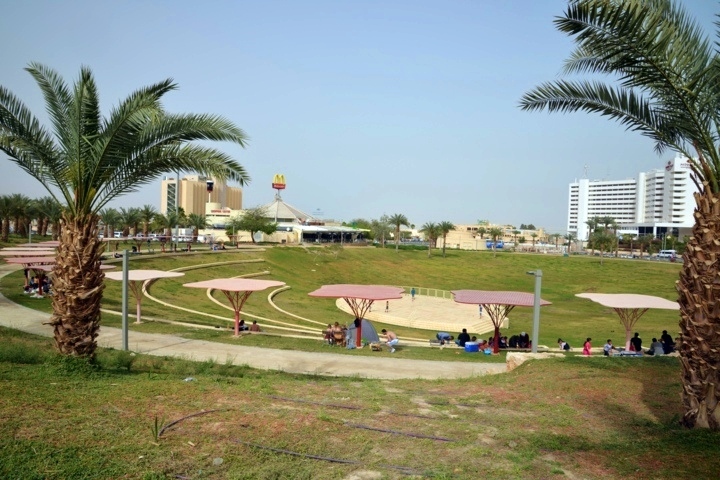 A large park is located in the center of the hotel area. 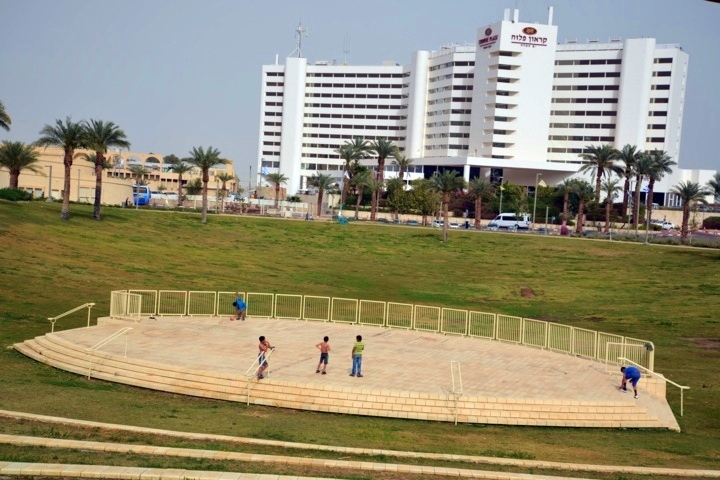 A performance stage is located in the center of the park, with the Crown Plaza hotel seen in the background of the photo. 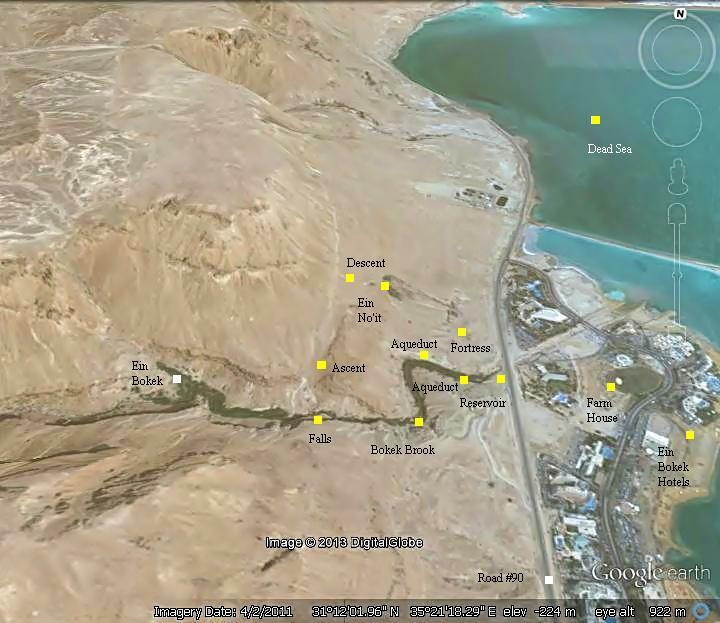 Before constructing this modern resort area - during the Hasmonean and roman/Byzantine periods- this place was the farming area of Ein Bokek. The crops included dates, spices and balsam perfume. During the vacation season and on weekends the visitors, who cannot afford the prices of the hotels, pitch tents, cook meat and their kids run around the park. 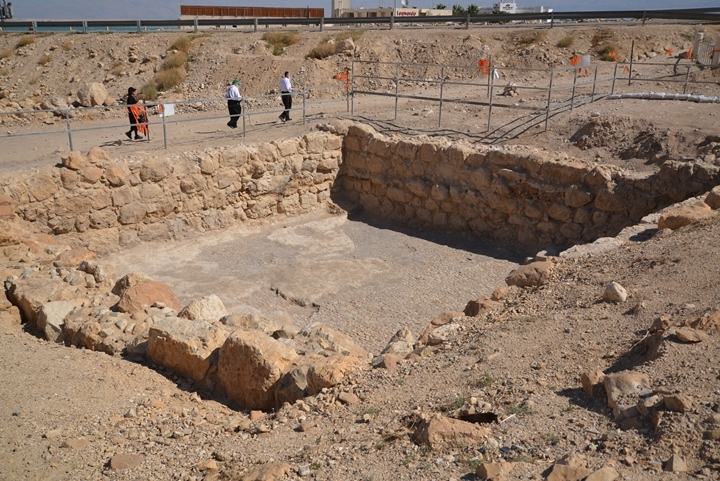 A farm house, dated to the Hasmonean and early Roman periods, was excavated in the park area of the hotels of Ein Bokek. The ancient farm house was reconstructed and integrated into the park, with wood beams and metal ladders. The structure is 23m by 23m, and consists of several rooms. This view is from the second level on the south-western side. 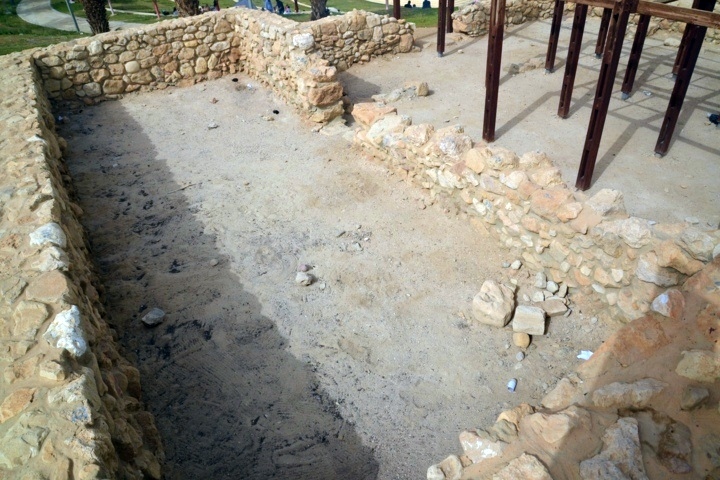 Traces of walls can also be seen under the southwest corner, as seen in the following photo. The water supply to the farm house was via the aqueduct from the valley of Nahal Bokek. Bokek - Biblical hebrew: "Make empty", after the Isaiah prophecy (Isaiah 24 1): "Behold, the LORD maketh the earth empty, and maketh it waste, and turneth it upside down, and scattereth abroad the inhabitants thereof". This name was given in the 20th C by the naming committee, based on the Arabic name. 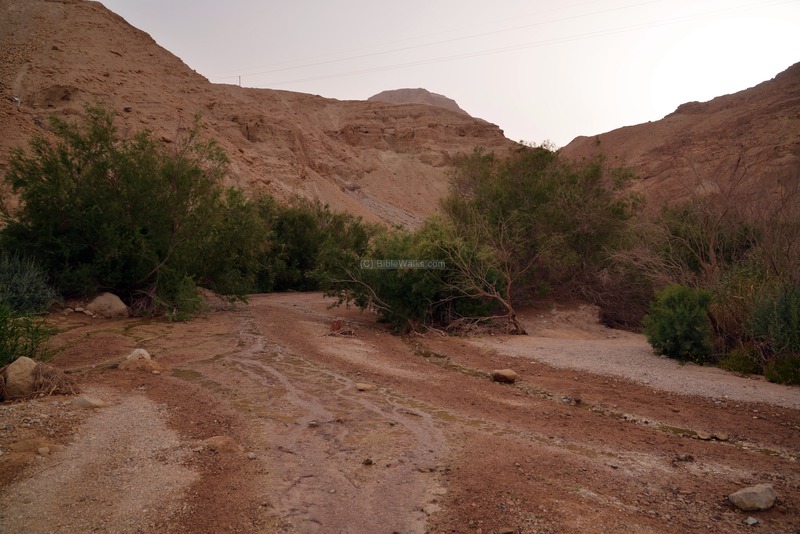 Umm Bagghik, Umm Baghghik, Oumm Baggeq, Umbaghek - various forms of the Arabic name of the brook; Unknown meaning, except for Umbaghek - "mother of the cows". Balsam - the balsam plant (persimmon, Hebrew: afarsemmon) was extracted to produce perfume. This rare plant grew only in few sites along the Dead Sea, and its process was a secret, which was lost after the Byzantine period. In modern Hebrew "perfume" is "Bosem", which was the source of the name of balsam, but in the Biblical texts it refers to the plant. In Songs of Songs (Songs of Solomon) the word Bosem is found in several verses, which was translated in KJV to spices: (5 1): "I have gathered my myrrh with my spice", (5:13): "His cheeks are as a bed of spices". The next verses is a popular Hebrew song (6 2):"My beloved is gone down into his garden, to the beds of spices, to feed in the gardens, and to gather lilies".